The photographs in this gallery predate digital cameras and are eather scans from prints or negatives from 1959 to the 1990s. This is an assortment of personal and commercial work as well as work from my time as a US Navy photographer when stationed aboard the USS Ranger. While on bombing missions during the Vietnam war sometimes a bomb would not release as the pilot expected. This was revered to as “hung ordnance' which made for a precarious and nerve wracking landing as the bomb could, and sometimes did release on the impact of a carrier landing with a 250lb bomb bouncing down the flight deck. 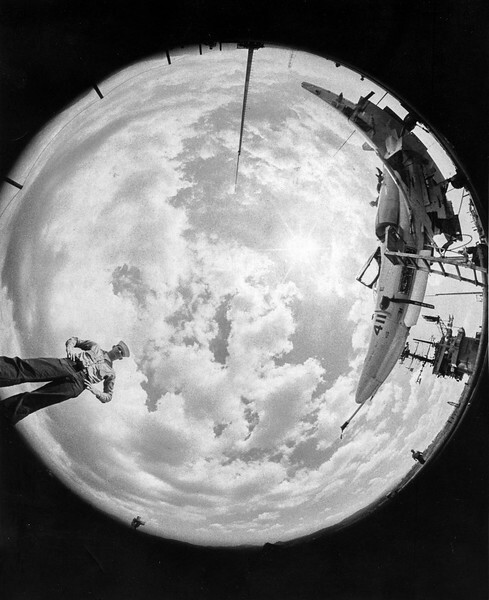 So a study was done with a motor driven Nikon camera with a 250 exposure film magazine and a 8mm fish-eye lens attached under the aircraft and when the bombs where dropped the camera made a lot of pictures real fast. After the bomb release studies where done and the problem solved the camera and lens where released to the photo lab of which I was a member. It was a novel lens for that time so I lay the camera on the flight deck and steeped back a couple of feet and made this picture.